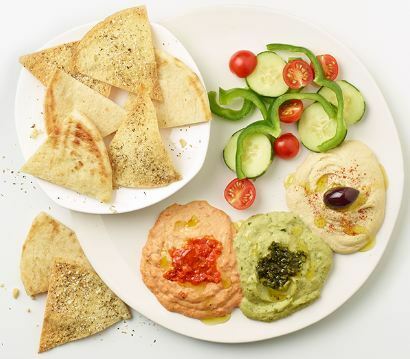 Zo”es Kitchen (NYSE:ZOES) , a fast-casual restaurant concept offering fresh, made-from-scratch Mediterranean dishes, today introduced new menu options, including a Mediterranean Chicken entr’ee and two new hummus offerings: Basil Pesto Hummus and Red Pepper Hummus. To complement these new hummus flavors, Zo”es Kitchen is also offering a new Hummus Trio appetizer, which provides guests a sampling of the two new flavors together with Zo”es signature classic hummus. These new menu options are now available at all Zo”es Kitchen restaurants nationwide. The Mediterranean Chicken dinner features lean, grilled chicken breast, marinated with Zo”es Kitchen “Spice of Life,” lemon juice, and garlic, topped with caramelized onions, and balanced with a side of Greek salad and rosemary white beans. Whether guests are dining in or taking out, this entr’ee is a flavorful, wholesome meal for lunch or dinner. All of Zo”es Kitchen hummus is made from scratch in the restaurant daily with only fresh ingredients, including chickpeas, tahini, virgin olive oil, fresh lemon juice and spices. The Basil Pesto Hummus is bright, flavorful and nut free, infused and topped with a made-from-scratch basil pesto prepared with fresh basil, spinach, chopped garlic and parmesan cheese. The Red Pepper Hummus is a delicious, zesty version of the classic hummus available at Zo”es Kitchen with a variety of additional spices, including paprika, cayenne pepper and crushed red pepper, mixed with roasted red peppers, lemon juice, garlic, salt and pepper. Guests can also choose a Hummus Trio to try a sampling of all hummus varieties including classic hummus, Basil Pesto, and Red Pepper – a perfect option to complement any entr’ee and ideal for sharing. Zo”es Kitchen hummus is served with pita bread, pita chips or sliced cucumbers for a gluten free option. All of the new menu items are also available on Zo”es Kitchen catering menu. For more information or to find a restaurant near you, visit www.zoeskitchen.com, like us on Facebook or follow Zo”es Kitchen on Twitter. Download the Zo”es Kitchen L.I.F.E. app on Android and Apple devices to receive goodies every time you upload a receipt. Founded in 1995, Zo”es Kitchen (NYSE:ZOES) is a fast casual restaurant concept serving a distinct menu of fresh, wholesome, Mediterranean-inspired dishes delivered with Southern hospitality. With 137 locations in 15 states across the United States, Zo”es Kitchen aims to deliver goodness to its guests by providing simple, tasty and fresh Mediterranean meals, inspired by family recipes, and made from scratch daily. For more information, please visit www.zoeskitchen.com, www.facebook.com/ZoesKitchen or twitter.com/ZoesKitchen.